Leonardo Bonucci says the blame is "50-50" between Moise Kean and Cagliari fans after supporters were heard making racist chants at the Juventus forward. Starting in the place of Cristiano Ronaldo, Kean scored in the 85th minute of Tuesday's 2-0 win in Serie A, effectively sealing the Juventus victory. 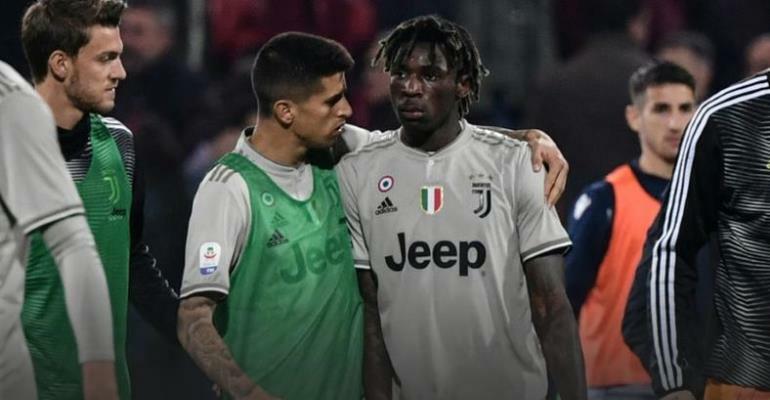 The 19-year-old forward stood in front of the home supporters following his finish, prompting Cagliari captain Luca Ceppitelli to come over in an effort to calm down the crowd amid alleged racist chants. Juventus midfielder Blaise Matuidi was also quick to react to the chants, but fellow team-mate Bonucci said Kean must avoid provoking situations like Tuesday's. “Kean knows that when he scores a goal, he has to focus on celebrating with his team-mates. He knows he could’ve done something differently too," Bonucci told Sky Sports Italia. Coach Massimiliano Allegri also spoke out regarding the chants, although he did not personally hear what was said. “He scored another goal and did better in the second half, whereas he got more or less everything wrong in the first half," he told Sky Sport Italia. “I didn’t hear anything from the stands, as I was focused on the game. You need great intelligence to deal with these situations and should not go to provoke people. That, of course, does not mean the idiots in the crowd and the way they reacted should be justified. “As always in life, there are idiots who do stupid things and ruin it for everyone else. I don’t think talking about it all the time helps. I don’t think halting play helps, because not everyone in the stadium did that.